No less than 33 different vehicles are racing past the reader in this funny board book. A bicycle, a fire engine, a taxi, a digger, a snowplow, a coach, a police car, a limousine, a gangster car, a delivery van, a motorbike with a side car, a fuel tanker … you name it! – they are all part of this crazy race … But where are they going? Can you guess what will finally make them stop? I’ll tell you this much: it’s yet another vehicle! A tremendously entertaining board book for the youngest. The nostalgic looking vehicles will not just amuse the children, but mum and dad alike. 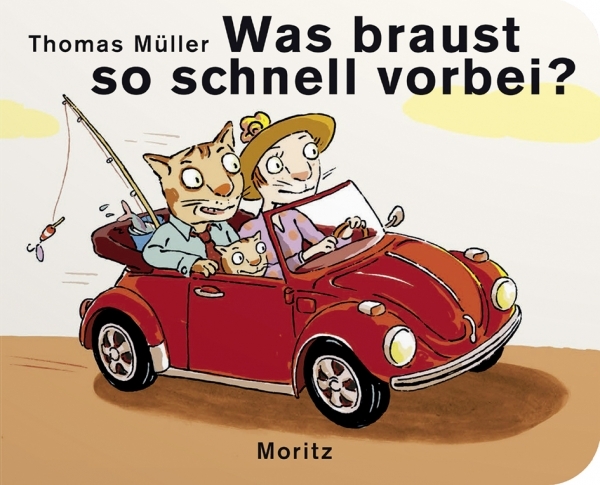 A refreshingly different take on the many books on vehicles that are published every year. There are lots of things to point out and to marvel at. The clever ending is bound to have the children insist on innumerous repetitions of the race.